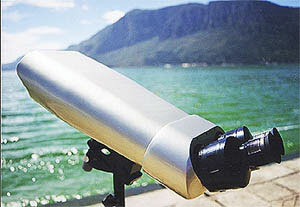 Giant binoculars 25x100 or 40x100 45 deg. You are here: Homepage /Giant binoculars/100mm binoculars/25x100 or 40x100 45 deg. 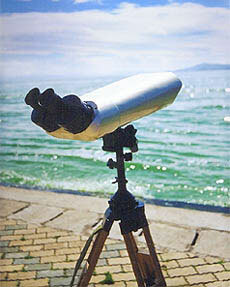 45 degree-ocular version of the 100mm giant binoculars are designed for more comfortable astronomical viewing. The body is painted either in silver or champagne. 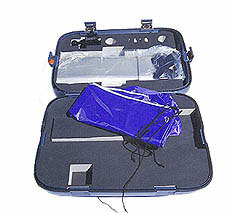 With one set of eyepieces (either 25x100 or 40x100). 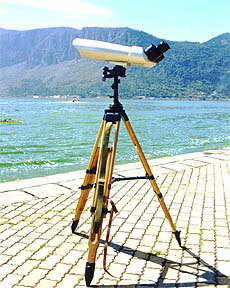 Comes complete with a wooden tripod, mount and the nylon case. Pricing: Our wholesales prices are kind of case sensitive and so are not published on the site. If you're a serious dealer or wholesaler, please email for the wholesales prices. To save time for both of us, you're recommended to read Initial contact first. Other 100mm giant binoculars models available are: 25/40x100 painted, 25/40x100 standard , 25/62x100 helical focuser, 25/40x100 coin-op, 25x100 FB and 22x100 astronomical. We don't retail. We only sell to the dealers and wholesalers. 1) Ask for the pricing? Please be sure to read Initial contact and Inquiry first. 2) Like to to start with the samples? Please check our samples ordering policy. 3) See Freight/quantity Optimization to know why and how to Optimize your order plan. 4) Turn-around time is the production time plus shipping time. 5) Payment methods usually used to do business with us. 6) General Customers clearance tips. Email us if you still don't get the answers here. Kunming Optical Instruments Co., Ltd.